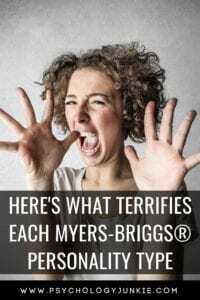 There are a lot of articles out there that seek to pinpoint the biggest fears of every Myers-Briggs® personality type. They are usually really good, but I’ve decided to take a different approach. Ever since last September I have worked on tallying up the worst fears of every single personality type. When I speak to people in forums, groups, or through my work as a practitioner I try to note what they mention. I’ve written articles about the top 10 fears of certain types, but I haven’t finished them all yet. It has been interesting to see which fears have gotten the most votes by each type. They aren’t always what you would expect! In order to complete this article, I got votes from at least 100 members of each type. Some fears are universal, so I won’t be addressing those in this post. And if you don’t relate to your fear? No worries! Not every single person of every type is going to 100% relate to their fear. I got these results by simply talking to hundreds of people and asking them what frightens them the most. They weren’t given a list of choices, because I wanted to know the fear that first came to their mind without them being affected by a pre-conceived list. Those three fears topped lists no matter what personality type was talking (except XSTPs, they weren’t too bothered by spiders!). ISTJs hated the idea of crowds! Privacy and personal space are essential to these types. Lack of security came in at a close second. These were the types most likely to have a home security system and also most likely to have a gun that they knew how to use within range of their bed. Many of them mentioned fear of home invasion as well. Find more of their fears here. ISFJs are deeply attached to their loved ones, and similarly to ISTJs, they had fears about security and home invasion. The idea of anything harmful happening to someone they cared about was an incentive for many ISFJs to learn self-defense or have security measures installed in their homes. They also tend to be exceptionally careful drivers. ESTJs loathe having to work with lazy, inefficient people or people who procrastinate. They want everyone to do their part and “toe the line”, and irresponsibility among team or family members will drive them crazy. This may not be a heart-racing, nightmare-producing fear, but it was what they mentioned most! Losing control and uncertainty were also major fears for ESTJs. ESFJs are extremely loyal individuals who are deeply committed to their loved ones. They are known for their responsibility, their generosity, and empathy. Being abandoned by those they’ve committed to and cared for topped their list of worst fears. ISFPs are free spirits who tend to make spontaneous decisions and follow their hearts. They fear making the wrong choice and becoming trapped in a situation they can’t get out of; whether it’s a job, a relationship, or a cross-country move. They want their options to be open at all times, to always know they can get out of a situation if it turns sour. ISTPs are extremely independent and self-sufficient individuals, and they despise the idea of having to rely wholly on others. Becoming physically handicapped in some way where they had to rely on the help of loved ones was by far their worst fear. Much like ISFPs, ESFPs greatly feared losing their freedom or being trapped in a mundane existence. They want to know they can change their mind if a decision leads in the wrong direction, and they want to know they have plenty of options and opportunities. ESTPs like to be aware and in control of themselves in their surroundings. They are known for their fast reflexes and adaptability, and the idea of losing this is appalling to them. They want to know that they can remain in control of themselves and not become helpless, trapped, or out of control. Some ESTPs I spoke with refrained from drinking, because they didn’t like the “out of control” feeling being drunk gave them. Other ESTPs didn’t enjoy roller coasters because they were strapped into something they couldn’t get out of. That said, these same ESTPs would have no qualms with skydiving or snowboarding or performing dangerous stunts. As long as they had their own physical freedom, they felt they were still in control. The mind is the veritable playground of the INTJ. This is where they can toy with perspectives, immerse themselves in intuition, and explore mental strategies. The idea of losing their mental clarity was by far the worst outcome they could imagine. Find out more about INTP fears here. ENTJs are natural-born leaders with enormous visions and dreams for the future. They are driven by an intense desire to make a difference in the world and live up to their fullest potential. They hate the idea of living a less than remarkable life, and they desire to stand out and achieve their dreams at all costs. Find out more about ENTJ fears here. Although ENTPs often enjoy many relationships and friendships, they are also very independent individuals. They love the freedom to explore numerous ideas and possibilities and the ability to investigate the outer world for inspiration. According to the MBTI® Manual, one of the most important aspects of being happy for an ENTP involves being autonomous. Find out more about ENTP fears here. INFPs are often called the Idealists, and it’s not hard to see why. They have very high standards for themselves and rely on a strong set of convictions and values. Their internal moral compass is powerful, because of their dominant Introverted Feeling (Fi) use. They also believe in everything they do having meaning and purpose. Numerous INFPs mentioned the fear of getting to the end of their lives and realizing that they wasted their potential, or didn’t do anything significant to make the world a better place. Find out more about INFP fears here. INFJs didn’t particularly fear being outside in the dark; in fact, most loved stargazing and night-time wanderings. However, INFJs did NOT like passing by dark, empty rooms or wandering in dark houses or buildings alone. Their rich imagination and ability to fill in the “unknown” with possibilities made them more likely than other types to imagine sinister entities lurking in dark corners, hallways, or closets. Find out more about INFJ fears here. The ENFJs I spoke with hated being alone; they felt that their lives were emptier and lacking meaning the longer they spent time in isolation. This makes sense considering their dominant function, Extraverted Feeling (Fe), is largely concerned with promoting the happiness and morale of others. Without others to encourage and communicate with, ENFJs would naturally feel an emptiness and imbalance in their lives. The biggest fear among ENFPs was being alone. However, this doesn’t mean they want to be around people constantly. The fear had more to do with not having meaningful relationships, dying alone, or feeling disconnected from humanity. Having a healthy social group, supportive friends, and meaningful, honest relationships are extremely important to ENFPs. Not living up to potential came in at a close second, with boredom coming in third. Find out more about ENFP fears here. Do you relate to these fears or the fears of other types? Let’s talk about it in the comments! Did you enjoy this post? Then you’ll love these! What did INFJs do that they deserve the silliest fear? But seriously, it really doesn’t apply to me, of all the things in the world, darkness? Nah.